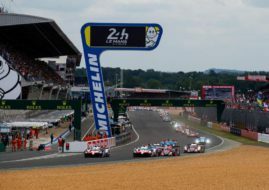 Sixty cars would be on the grid for the 85th running of the 24 hours of Le Mans, the world’s greatest endurance race which will take place at the French Circuit de la Sarthe on June 17-18, 2017. 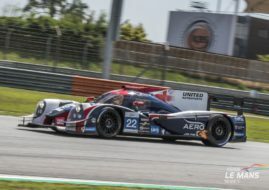 Automobile Club de l’Ouest and FIA revealed the provisional entry list more than four months before the race, together with lists of teams that would participate full season in the FIA WEC and ELMS championships. Sixty-car grid was set last year for the first time since tragical 1955 race and organisers repeat that number again for this year’s edition. The entry list comprises 6 LMP1 prototypes, 25 LMP2s, 13 GTE Pro crews and 16 GTE Am teams. LMP1 as a top class dropped to five full-time entrants for the 2017 WEC season. Toyota added one more car to increase its chances for Le Mans victory which Japanese team dramatically lost last year. There were no suprises among the names of Porsche and Toyota factory LMP1 drivers so the biggest novelty at the revelation of the entry list was return of Robert Kubica to full-time circuit racing. The former Formula One start spent few years as commited rally driver and now enters endurance racing as a member of By Kolles Racing, ready to drive new CLM P1/01-Nissan prototype. 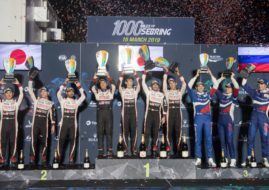 Of three last year’s winner, only Neel Jani will try to defend its crown in the #1 Porsche 919 Hybrid, sharing the car with former winners Andre Lotterer and Nick Tandy. Jani’s last year’s teammates Romain Dumas and Marc Lieb are out of team, same as 2015 world champ Mark Webber, who will serve as a Grand Marshal. In the LMP2 class, last year’s winners Nicolas Lapierre and Stephane Richelmi are returning, but separated in two Signatech Alpine cars. The biggest ever LMP2 grid comprises of thirteen Oreca 07 prototypes and six Ligier JS P217 cars. The rest are three Dallara P217s, two Alpine A470s (rebranded Oreca) and one Riley Mk30. All LMP2 prototypes are powered by Gibson engines. In the GTE Pro field, Ford will defend last year’s victory with four cars, against three Ferrari, two Porsches and two Aston Martins. Two Scuderia Corsa’s Ferrari will be on the grid to defend team’s last year’s GTE Am victory. There will be eight Ferraris in total, against four Porsches, three Aston Martins and one Chevrolet Corvette.